The essays collected for this volume represent the best scholarly literature on Hugo Grotius available in the English language. 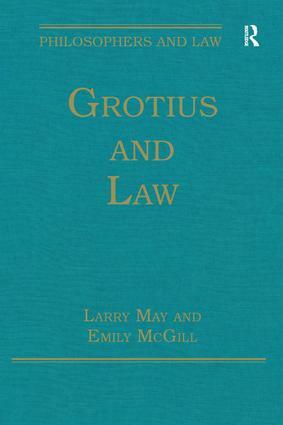 In the English speaking world Grotius is not as well known as his fellow 17th century political philosophers, Thomas Hobbes or John Locke, but in legal theory Grotius is at least as important. Even on central political concepts such as liberty and property, Grotius has important views that should be explored by anyone working in legal and political philosophy. And Grotius’s work, especially De Jure Belli ac Pacis, is much more important in international law and the laws of war than anyone else’s work in the 17th or 18th centuries. This volume is therefore useful not only to Grotius scholars, but also to anyone interested in historical and modern debates on key issues in political and legal philosophy more broadly, and international law in particular. Contents: Introduction. Part I Grotius’s Place in the History of Legal and Political Thought: Grotius: 10 April 1583-28 August 1645, Martin Wight; Hugo Grotius, Richard Tuck; Hugo Grotius and the history of political thought, Knud Haakonssen. Part II Natural Law and Natural Right: Natural law restated: Suarez and Grotius, J.B. Schneewind; Common rights of mankind in Gentili, Grotius and Suárez, Theodor Meron; ‘Ancient Caesarian lawyers’ in a state of nature: Roman tradition and natural rights in Hugo Grotius’s De iure praedae, Benjamin Straumann. Part III Liberty, Necessity and Roman Law: Popular liberty, princely government, and the Roman law in Hugo Grotius’s De Jure Belli ac Pacis, Daniel Lee; Grotius and Pufendorf on the right of necessity, John Salter; Is modern liberty ancient? Roman remedies and natural rights in Hugo Grotius’s early works on natural law, Benjamin Straumann. Part IV Property Rights and Law: Hugo Grotius: property and consent, John Salter; Proprietary rights, Christoph A. Stumpf; Hugo Grotius, contractualism, and the concept of private property: an institutionalist interpretation, Marcelo de Araujo. Part V The Law of War and Peace: The importance of Grotius in the study of international relations, Hedley Bull; Hugo Grotius on ethics and war, Steven Forde; Grotius and contingent pacifism, Larry May; Pacifying politics: resistance, violence, and accountability in seventeenth-century contract theory, Deborah Baumgold. Part VI International Law: Hugo Grotius in the contemporary memory of international law: secularism, liberalism, and the politics of restatement and denial, John D. Haskell; The Grotian vision of world order, Cornelius F. Murphy Jr; Grotius on natural and international law, Hendrik van Eikema Hommes; The Grotian tradition in international law, Hersch Lauterpacht. Name index. Larry May is W. Alton Jones Professor of Philosophy, Professor of Law, and Professor of Political Science, at Vanderbilt University. He has published twelve authored monographs and seventeen edited books. His books have won multiple awards in law, philosophy, and international relations. In the last five years there have been four conferences in Europe concerning his work, the most recent in St. Andrews, UK. Emily McGill is a graduate student in Philosophy at Vanderbilt University. She works primarily in social-political philosophy and ethics, and is currently writing a dissertation on relational autonomy and feminism.